Earn up to 15,992 reward points. Ideal for today's modern player who enjoys playing with alternate tunings. The PRS 2-Channel Custom 50 Combo Amp is a versatile, modern amp with several features that give players ultimate versatility and musicality. Each channel features channel volume, bright switch, treble, middle, bass, and master volume controls. The lead channel also has a switchable mid-shift that will either scoop some of the midrange when "in" or act as a fat boost for that channel when pulled out. There is also a global push/pull presence control that provides a depth boost and a global push/pull reverb control. When the reverb knob is pulled, the reverb will only work on the clean channel. This allows you to have global reverb engaged and be able to switch seamlessly between lead channel without reverb and clean channel with reverb (via the footswitch). The 3-button LED footswitch also has a solo boost and channel selection. The 2-Channel Custom 50 has a full effects loop and can cascade from clean to gain without losing articulation, making it a great platform for pedals. 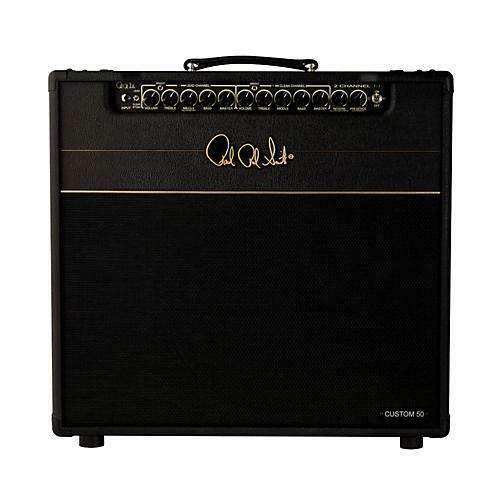 Add this combo amp to your rig with a click or call today!